This page will provide you with current office specials and news, just click an image to find out more. COMPLETE PREVENTIVE CARE VISIT for new and existing patients 5-12 yrs of age. Click the thumbnail above for details. 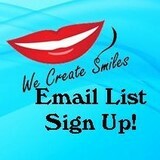 Click on this great smile to find out about our Website only SAVINGS this month on Teeth Whitening! Click on the before and after for info on our Smile Consultation Special and get started planning your new smile today! Are you without dental insurance? Have you been putting off regular care because your not covered? Find out more about our In-Office Dental Plan to help you stay on top of your dental needs. Click the thumbnail above for more info. for the January 2016 in-office whitening contest. Find out more about our Referral Program and print a referral card to give to a family member or friend who has not yet been to our office. Click thumbnail for more information and access to printable card. View your account, pay your bill, and see future appointments in your new Patient Portal. Click the thumbnail above for more information! In this section, you can read our most current newsletter! If you are not a patient, but would like to start receiving our newsletters, you can sign up to start receiving them. Click to view twitter feed.